Safety First (Part I) – What is Workplace Safety? The concept of Workplace Safety has had a relatively long history in our business and industrial culture. In fact, many people reading this have some firsthand knowledge of the safety standards and procedures at their place of work. But what exactly is Workplace Safety and why does it matter? This is the first in a series of posts on Workplace Safety. 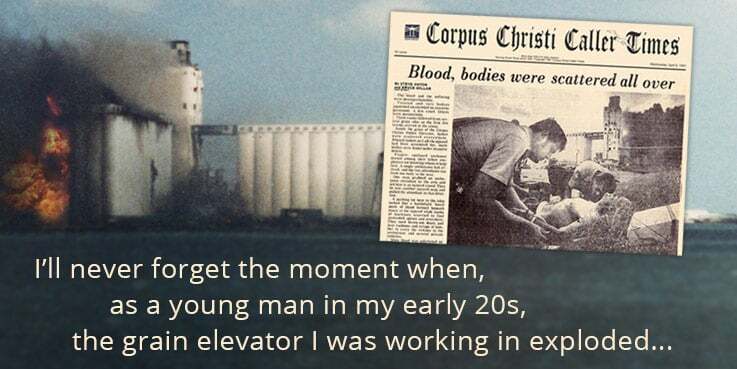 Thirty-seven years ago, I was completely paralyzed from the chest down in a workplace accident. And I will be confined to a wheelchair for the rest of my life, only because of a Safety issue that was ignored by the people who ran the facility I was working at. It started when my team of inspectors identified a serious safety issue affecting the ventilation and dust extraction system that needed immediate attention. After double-checking our findings, we immediately brought it to the attention of the facility operators. We presented the data to them, recommending an immediate shut down and maintenance. The maintenance wasn’t necessary and would be too expensive (estimated a $3 million) to get it fixed properly. The report was shelved and it was back to “business as usual.” The very next day, at 3:10pm, 12 explosions ripped through the facility, completely destroying it and causing massive loss of life and countless injuries. Think Safety Is Expensive? Not Compared to an Accident. 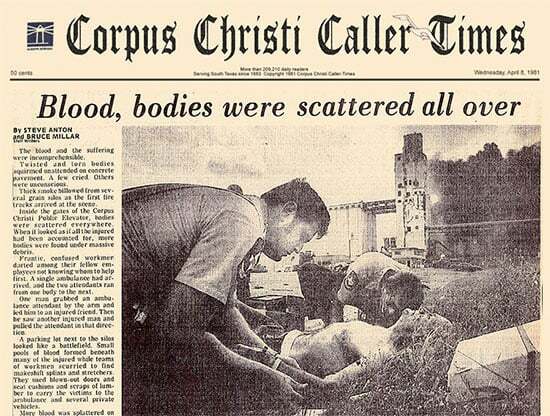 The newspaper headlines the next day read that Blood, bodies were scattered all over that the parking lot around the grain elevator looked like a battlefield. The cost in human life was staggering, but that wasn’t the end of it. Those same people who downplayed the importance of safety the day before now faced lawsuits, as well as a rebuilding process that would take over a year at a cost of hundreds of millions of dollars. To avoid a normal – and critical – maintenance expense, they literally gambled with the lives of every employee, and ended up losing far more in the process. 200 years ago, industrial workers in Europe were the first to form unions and demand safer working conditions. In 1877, Massachusetts introduced the first health and safety laws. By 1912, the organization now known as the National Safety Council was established to promote accident prevention programs. Much of the early focus on safety was related to things we consider essential – and common sense – these days: fire exits, guards on dangerous parts of machinery, and basic safety gear. During the mid-1900s, Safety rules expanded to include hard hats, safety lines and respirators, and reductions to chemical exposure on the job. And with every passing decade, we identify more dangers that workers must be protected from to ensure their health and safety at work. But as my experience shows, all the laws on the books, all the carefully documented safety procedures, and all of the training in the world don’t matter if a single person at the workplace is lacking a “safety first” attitude. Photo taken during explosion from across the ship channel, showing a huge “torch” of flame rising far above the 14-story silos on the right. I was in a building right next to that blast. In the microseconds after the deafening explosions reached me, I was blasted through the roof of a 2-story building, instantly losing consciousness as I was flung over 300 feet in the air. I crashed down, landing hard on my head and shoulders on a concrete parking lot. When paramedics found my body in the aftermath, broken at the chest like you would bend at the waist, they examined me and vital signs were so low they “black-flagged” me, thinking I would probably not last long. But somehow I was taken to the hospital, still alive. After being given a 1% chance of survival, I held onto life by a thread. Miraculously, my body began to heal, one small victory at a time. A strong faith in God and answered prayers gave me a second chance to live. My world had literally been blown apart, and it would take every ounce of will that I had to adapt to my new reality. 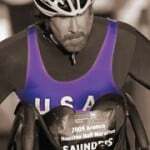 Eventually, I would find a new purpose through sports and start achieving things that I had never considered to be possible: representing Team USA at Paralympic and World Games, working with Oliver Stone and Tom Cruise as a principal actor in the film, “Born on the Fourth of July”, and working directly with 3 US presidents as part of the President’s Council on Fitness, Sports and Nutrition. In my life, I have been blessed with the opportunity to KEEP GOING FOR THE GOLD in many ways. One of the most important to me is to be an advocate for Workplace Safety. As a Safety Speaker, I get to share my story with audiences around the country and remind them of the importance of Workplace Safety. It’s an area of our careers and personal lives that deserves meticulous attention and preventive action. Tragedies are expected in life, but most are avoidable if you go back far enough to the critical decision, failure, action or inaction that made it possible. My goal when presenting on the topic of Safety in the Workplace is to bring a higher level of awareness and accountability to every team member, so that on-the-job accidents can be avoided. June is “National Safety Month.” If you are looking for a professional Safety Speaker who can educate and inspire your group to higher standards around workplace safety, contact us at (713) 686-0077 or fill out this form to learn more about booking Kevin Saunders for a presentation. To read what people had to say after hearing my safety presentations, look under the Testimonials tab and click on Safety.